CIRCUS OZ in the Big Top at Darling Harbour. CIRCUS OZ is 35 years old and now in a glorious air conditioned Big Top, they present a new show called CRANKED UP (it is version 2.0 of FROM THE GROUND, which premiered in Melbourne in June, 2012), set on a building site, where they have, so the program notes tell us, "knocked together a series of circus acts around the ideas of construction, building and fabrication", to provide all the necessary opportunities to display the virtuosic skills of this 13 strong company. Add musicians. They do it all, and it is the 'company ensemble' blending of skills that impresses. Especially, someone like myself who has never seen the company before. Certainly, the warmth that the audience, on opening night, gave to the performers and the performance is some measure of the place that this company has developed, for some, over its history. This company has two indigenous performers, Dale Woodbridge and Mark Sheppard, delighting the audience, (that is diversity, I guess. The company has made efforts to reach into the Indigenous communities, whilst on tour and now, says the program notes, has a dedicated Koori Programs Manager - that is, certainly an important cultural commitment and, by-the way, good governmental politics!). There are several, passing, 'political' asides made, during the show, concerning social justice (asylum refugees and gay marriage rights, for example), and lots and lots of good times, signalled by the laughter and, sometimes, a sense of awe, at the thrill of some of the acts. There is a feel of community inclusiveness about this circus, a feel-good 'family' vibe. I felt that if Judy Garland and Mickey Rooney were still making those MGM films known as the "backyard musicals" - you remember the ones, where Judy and Mickey would convert the local barn or garage or whatever, and 'put on a show' with the local talent that would knock Broadway-for-a-six - and Circus Oz could get their attention, they might be onto something very promising indeed. "If not MGM, or Disney, then how about ... let us see ... I know, Bazmark! Keep it in the Aussie family. 'Hey, Baz, here is your next musical!' 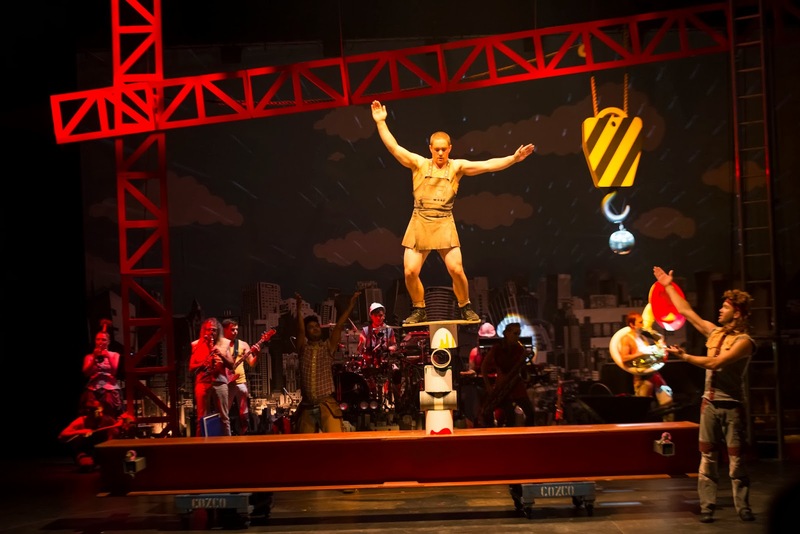 "
Circus Oz has that feel about it: "Anybody can do this" and excites, the kids, perhaps, that they could do it, too. On the night I saw CRANKED UP, this company dropped enough of their tools and skills to make some of us feel that we could, indeed, do it. The 'near enough is pretty good enough' quality of performance standard was what one took away from this show, overwhelming the positive impression that the few agile (or competent) acts and performers had given us. There was no embarrassment about the 'drop' or 'fudge' from this company (the orchestra's improvisational ability, led by Bec Matthews, is very watchful, and a great support in covering this dimension of the show), and so, erudition was surpassed by home spun charm - an Aussie larrikinism was substituted for dependable (let alone once-in-a-lifetime) skills. I did have remembrances, unfortunately, of the Canadian Cirque Du Soleil skills plaguing my experience in this Bog Top at Darling Harbour, and certainly thought, "You know, I want more AMAZING SKILLS on display here." Maybe, this was just a night of unusual performance aberrations. I loved and was amazed at Mason West's balancing act. I loved the musical 'wrecking ball' from Bec Matthews. I admired the trapeze stuff (but, then, one always does love the thrill of it, even the patently obvious 'failures' that necessitate the repeat of a 'trick' - my childhood memories of Ashton Circus and their trapeze, tented up in the local park, are treasured still.) I laughed at the easeful comedy of Dale Woodbridge and all his other contributions. Truth to tell, I had a 'relaxed and comfortable' time - but, hardly what I would call, what Circus Oz promises, a 'radical' night out. It is a good 'family', inclusive middle-of-the-road circus show with just enough going-on to please the good old Australian larrikins who once would have liked to have run away with the circus. For, it looks as if anybody can do the tricks for Circus Oz, if they have enough chutzpah, and don't have to worry about the old axiom that 'practice makes perfect'. N.B. 1. The program notes to Circus Oz - CRANKED UP.